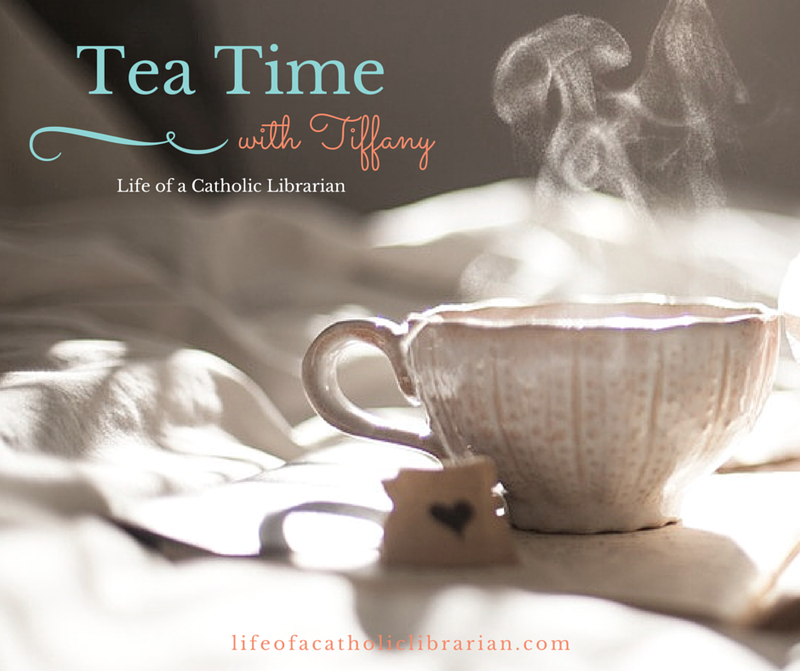 Life of a Catholic Librarian: Tea Time with Tiffany #102 - Summer vacation books and projects! Tea Time with Tiffany #102 - Summer vacation books and projects! Today we talk summer vacation, amusement park fears, summer reading and dancing, and July novenas. Join me! Start of performance season post! On My Bookshelf - We have a bit of a Readers Advisory today! Sam has some recommendations for us this week. If you like the Harry Potter series, you'll also enjoy the middle reader/YA books on this list! The Well, as part of our Summer Book Club, Part 2! Prayer Corner - The feast of St. Kateri is July 14th. Her novena will begin July 5th! If you'd like to pray along with her chaplet, visit my Chaplets page for both audio and video. Creative Commons -I started knitting a cabled hat that looks like the one Emma Watson was wearing in the film version of Harry Potter and the Half Blood Prince. The pattern is called Hermione Hearts Ron, and is free! What are your plans for this American holiday weekend? Are you working on any summery crafts, or starting new book series? Do write in and tell us! Ever After High does sound good! I've read another series by Shannon Hale and it was pretty good. I also have read the Land of Stories books from that list. The rest of them are new to me. On my bookshelf: Starting the Goblet of Fire tonight. Reading along with The Well. I'm also reading The Bride's Matchmaking Triplets (LI Historic). Prayer Corner: wanting to start up with LOTH again, but that hasn't happened yet. Will be praying along for the St. Kateri novena. That hat is super cute! I'm currently loom knitting a hat...or attempting to we'll see how far I get. LOL And I have been making these hook grips out of rubber bands. You use the rubber bands for the rainbow loom but I just use my regular looms. Thank you youtube for video tutorials. LOL They are super cute and easy to make and make loom knitting a little more comfortable. With all your harry potter talk I totally forgot that I bought the Harry Potter and the cursed child play last summer and never read it. I'm going to have to get back to that. Hi Beth Anne! I saw your hat progress on Facebook, and it looks awesome! Good work, girl. I love that you're using a loom, that's a craft I don't know just yet! ooooo, the Cursed Child. I heard about this when it came out, but I wasn't into Harry Potter yet, so it's totally new to me. Let me know what you think of it! Just started a new cross stitch for a friend's birthday in July. It's very small so I might finish. Reading a lot of children's and YA set in summer camps and during WWII for research. I'm also reading a new series by Guideposts about two cousins who start a tearoom - Tearoom something??? We used to have a cookout on the 4th but this year will be a little different as my sister begins chemo on Monday - so we will be home taking it a little easy. I'm planning to get out my sewing machine and work on some projects so I'll be available if she needs something. We are watching a lot of funny movies to stay positive if anyone has suggestions. Your cross stitch sounds lovely! I don't know how to do this craft either, but I've always wanted to learn. Tearoom series?! I need to know the title. :0 Still praying for your sister. Do you watch the Hallmark Channel/Hallmark Movies & Mysteries? I know they're having a Christmas in July run coming up, with Christmas romance movies. They are so lovely! If you haven't read Harry Potter, I talk in somewhat coded language about spoilers below. Now that you have finished Prisoner of Azkaban, I can tell you that Sirius is another of my favorite characters. Wow, the end of the story but especially the part in the Shrieking Shack. It blew my mind the first time I read it and still sometimes surprises me on a reread. I'd say more but can't without spoilers for anyone who hasn't read it yet. From the public library this week, I brought home Will Wilder #2 (The Lost Staff of Wonders) which features the staff of Moses and At Home in the World : Reflections on Belonging While Wandering the Globe : An Adventure Across 4 Continents with 3 Kids, 1 Husband, and 5 Backpacks by Tsh Oxenreider. I've started At Home in the World and so far I'm enjoying it. From another library where I work I brought home The Ultimate Catholic Comic Book. It is full of fun Catholic humor. I finished it so it goes back to work to be cataloged on Monday. Excellent book suggestions, thank you! Yes, I really loved Prisoner of Azkaban. Probably my favorite book of the series so far. We're watching the movies too, as I move through the books. I didn't enjoy the movie as much as the book, simply because so much material was left out. Obviously, I understand why that would be the case, but I so love the immersive detail of the books!